1.Heat oven to 350°F (325°F for dark or nonstick pan). Line 8-inch or 9-inch square pan with foil, letting foil hang 2 inches over sides of pan. Grease bottom only of foil with shortening or cooking spray. Make and bake brownies as directed on box. Cool completely, about 1 1/2 hours. Meanwhile, place 2/3 cup chocolate chips and the whipping cream in large microwavable bowl. Microwave uncovered on High 2 to 3 minutes, stirring with wire whisk every minute, until chocolate is melted. Stir until mixture is smooth. Cover; refrigerate about 1 to 1 1/2 hours or until chilled and set. Stir frosting into chilled cream mixture. Beat with electric mixer on high speed 1 to 2 minutes or until well blended and soft peaks form. Spoon into serving dish. Remove brownie from pan by lifting foil; peel away foil. Cut brownie into 4 rows by 4 rows, making 16 squares. Cut each square in half diagonally to make 32 triangles. Arrange on serving plate. To set up Build-a-Brownie serving bar, arrange brownies and frosting mixture along with small knives for spreading frosting on brownies. 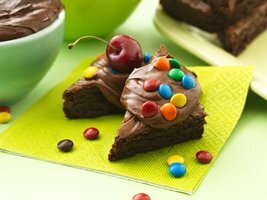 In small bowls, place baking bits, miniature chips and cherries for topping brownies.